Giving back to the communities in which we operate is fundamental to us. Our deep understanding of the markets in which we operate enables us to appreciate the interests of the local communities and we are steadfast in our support of their social and economic development. Guided by our values of being Honourable, Enterprising, United and Committed, we contribute to these communities holistically through philanthropy, partnerships and employee participation, and by being inclusive. 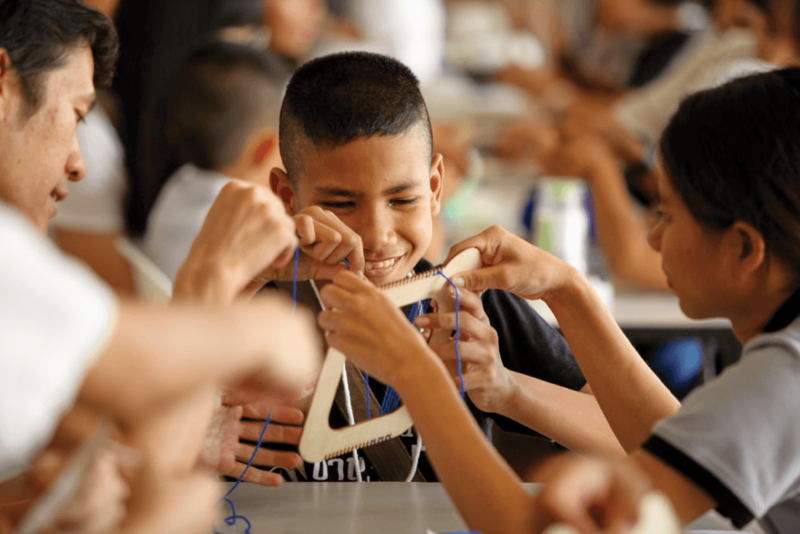 Our programmes connect people, strengthen bonds and enrich lives through art, children and education. 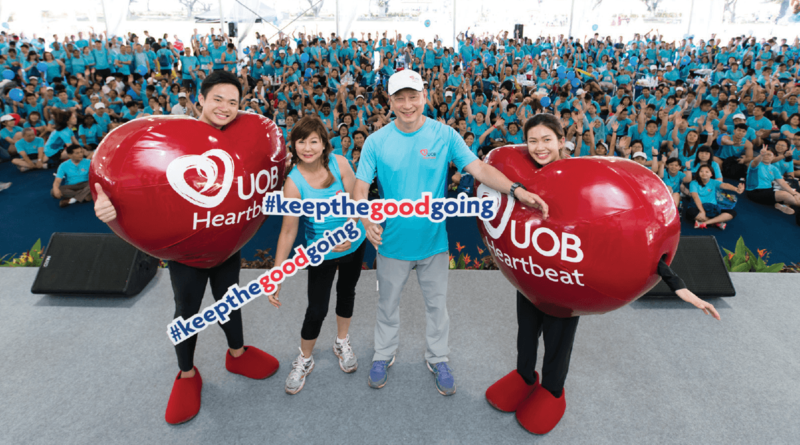 Mr Wee Ee Cheong, UOB Deputy Chairman and CEO and Ms Jenny Wong, Group Head of Human Resources, with more than 7,000 colleagues, their families and customers at the 2017 UOB Heartbeat Run/Walk in Singapore to raise funds for our beneficiaries. Facilitated funding for, and invested in, companies in the region and encouraged them to improve their environmental, social and governance considerations. As a leading bank in Asia, we are committed to supporting sustainable business investment and long-term economic growth in the markets in which we operate. In the course of conducting our business, we create direct and indirect economic value for our stakeholders. In 2017, we provided livelihoods for more than 25,000 people across our network spanning 19 countries and territories. We continued to support local businesses and helped to create jobs through the goods and services we bought from more than 9,900 suppliers in our six main markets. More than $2.2 billion of our total income was distributed to our people as employee compensation and benefits, which in turn contributed to spending within local economies. We also accrued $800 million in income tax to various governments. As part of our approach to ensuring sustainable business growth, we support investment which facilitates economic development, empowers local communities and improves lives. In Singapore, we provided a $15 million loan to sustainable energy provider Sunseap Group, for a series of long-term solar power projects that will help reduce the carbon footprint of companies in the country. This series includes the largest rooftop solar power project in a single site in Singapore. More information can be found in the Investment Management section of this report. 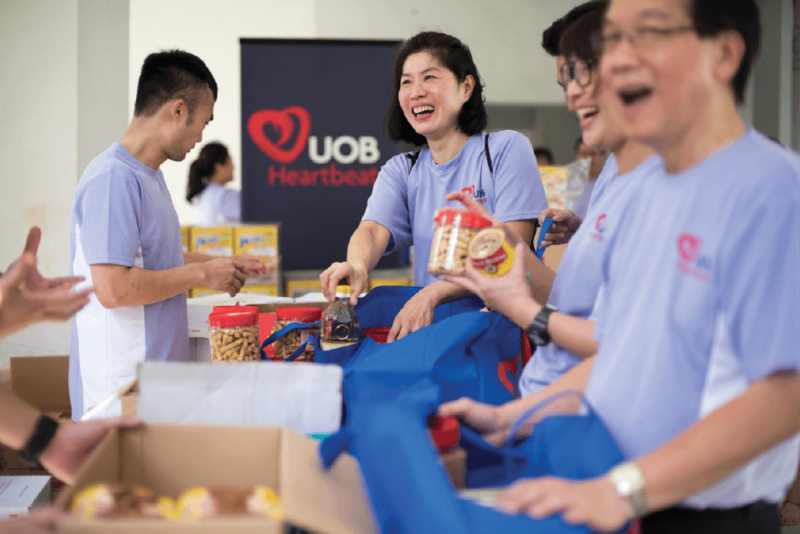 The UOB Heartbeat Corporate Social Responsibility Programme connects our customers, our partners and our colleagues across the Group to harness the power of the collective for the benefit of our communities. Through partnership, philanthropy and participation initiatives, the UOB Heartbeat programme demonstrates our long-term commitment to these communities. We focus on three areas which we believe are essential for the quality and progress of society: art, children and education. The regional and country winners of the 36ᵗʰ UOB POY competition against a backdrop inspired by the winning regional painting from the year before. We believe that art transcends the boundaries of geographies, economies and time to draw people together through a deeper understanding and appreciation of our common roots and linkages. 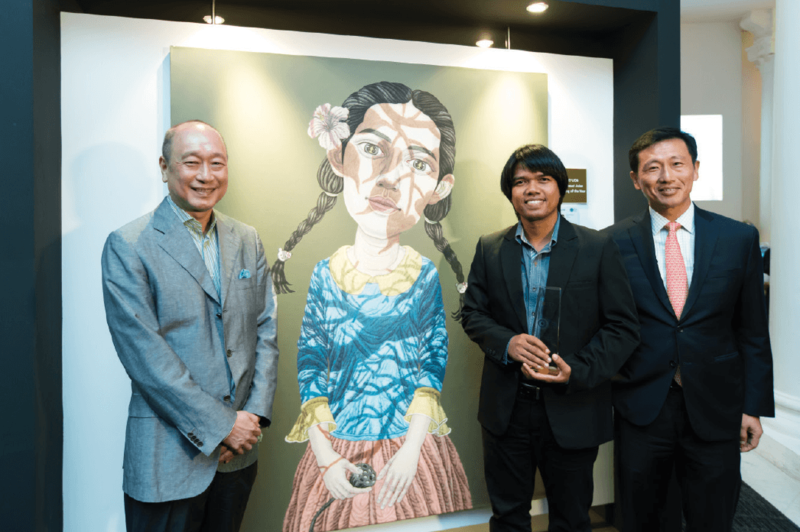 With our deep roots in Southeast Asia, we are steadfast in supporting the development of art in the region and our annual UOB Painting of the Year (POY) competition underscores this commitment. Started in 1982, the POY is the longest-running art competition in Singapore and one of the most recognised in Southeast Asia. To nurture and to encourage aspiring and established artists in the region, we hold the competition in Singapore, Indonesia, Malaysia and Thailand, with the most outstanding artwork chosen for the UOB Southeast Asian Painting of the Year Award. The recipient of the 2017 award was Mr Sukit Choosri from Thailand for his work, One Life, which depicted the transience of life. Mr Wee Ee Cheong, UOB Deputy Chairman and CEO, with UOB Southeast Asian POY winner Mr Sukit Choosri from Thailand and Singapore’s Minister for Education (Higher Education and Skills) and Second Minister for Defence, Mr Ong Ye Kung. We also promote artistic talent across the region by raising the profiles of the UOB POY winning artists and by providing them with opportunities to showcase their works. Since 2007, we have been exhibiting collections of their paintings at our UOB Art Gallery at UOB Plaza in Singapore. 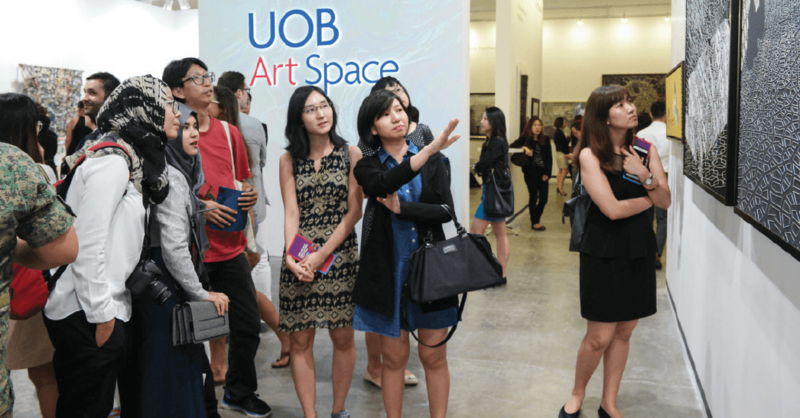 In 2017, we presented more than 50 artworks of the 15 UOB POY alumni from across the region at Art Stage Singapore, giving them another stage to interact with art collectors and curators. We promoted the works of Indonesian UOB POY artists through an exhibition we organised at Art Jakarta 2017. To inspire art students to pursue their passion, we held art dialogue sessions at schools across the region. 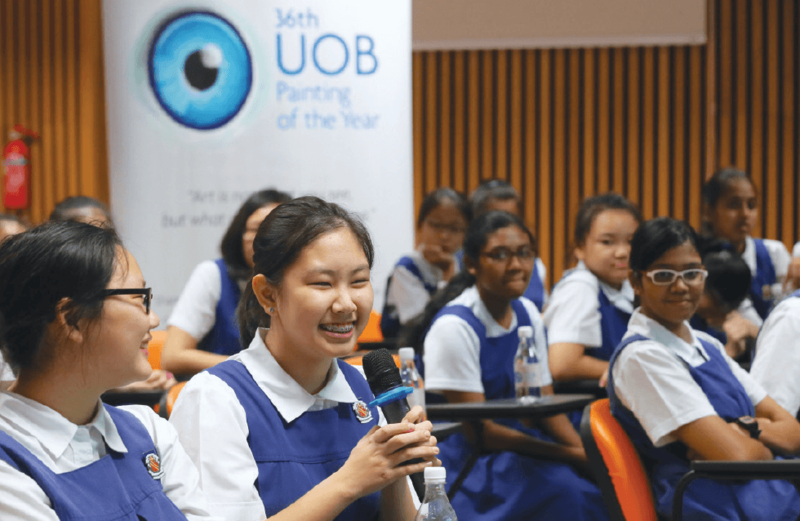 In 2017, we launched the Artist’s Conversations series in Singapore where our UOB POY alumni artists shared their experiences with more than 600 students from schools with the Art Elective Programme. In Indonesia, we arranged for local artists and the Executive Director of Japan’s Fukuoka Asian Art Museum to share their thoughts on Asian contemporary art with students at the Bandung Institute of Technology and at the Indonesian Institute of the Arts Yogyakarta. Visitors absorbing the richness of Southeast Asian art at our UOB Art Space at Art Stage Singapore 2017. More than 400 art students from Nanyang Girls’ High School in conversation with award-winning artists in Singapore. 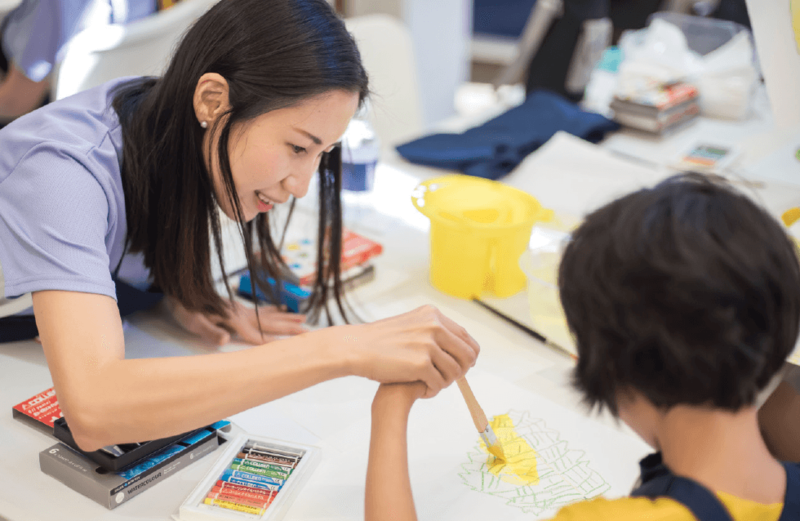 As part of our art outreach efforts, in 2017 we conducted seven UOB Heartbeat art workshops in Singapore for more than 250 underprivileged children and those with special needs. We aimed to help them express themselves more confidently through art. 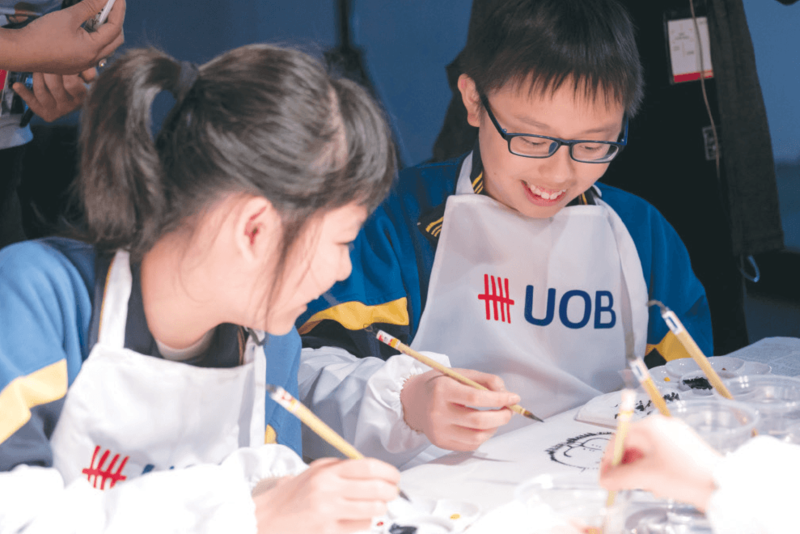 The workshops led by our UOB POY artists included acrylic and watercolour painting sessions and a special food art workshop by popular bento artist, Little Miss Bento. 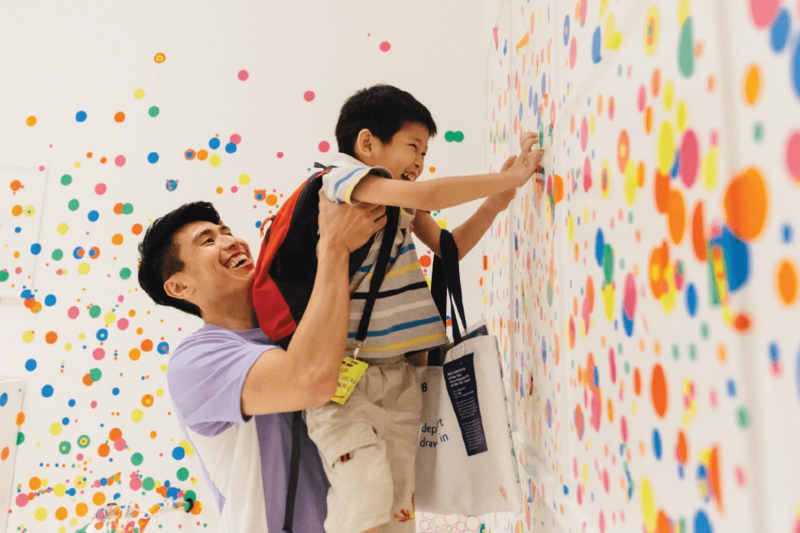 We also brought children to the National Gallery Singapore to experience the Children’s Biennale and the Yayoi Kusuma: Life is the Heart of a Rainbow exhibition. Since 2015, we have been championing the UOB Please Touch programme in Thailand, an initiative to help people with visual impairment to experience and to enjoy art. In 2017, we partnered an art professor and handicraft experts to train 330 of our colleagues and business partners as volunteers at the UOB Please Touch workshops. Together, they helped to bring art to more than 335 visually-impaired people through a 10-week programme. 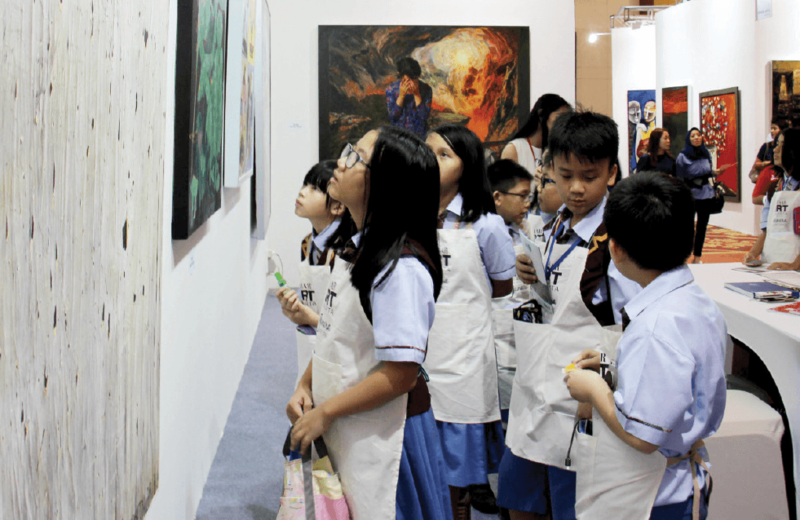 Our team in Hong Kong arranged for the organisers of the Art Central fair to take teenage students from less privileged backgrounds on a guided exhibition tour. The visit culminated in an onsite art workshop where an art tutor shared sketching tips with the students. 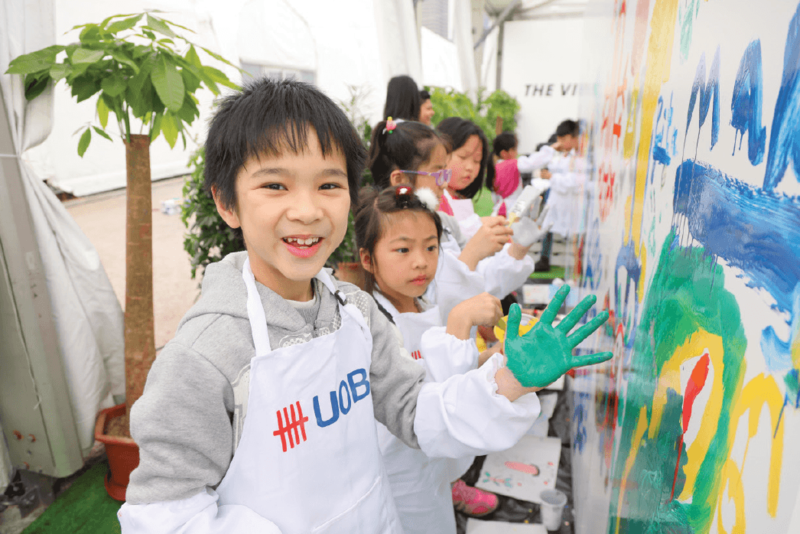 Our colleagues also worked with the Hong Kong Christian Service to organise an outdoor mural painting session for 21 underprivileged children. The completed mural was displayed at Art Central. UOB’s support of art began in the 1970s and deepened as the Bank’s network grew, reflecting its commitment to communities in Southeast Asia. The UOB Art Collection today holds more than 2,300 artworks, mainly comprising paintings by emerging and established Southeast Asian artists. These provide powerful, visual commentary of the region’s growth and diversity. A number of the paintings are on permanent display at the UOB Southeast Asia Gallery at the National Gallery Singapore of which the Bank is a founding partner. To raise awareness of the richness of Southeast Asian art, in 2017, we gave out 700 gallery tickets to the community and our colleagues. A family’s consuming passion for art at our art bento workshop in Singapore. Reframing the perception of art at a UOB Please Touch workshop in Thailand. 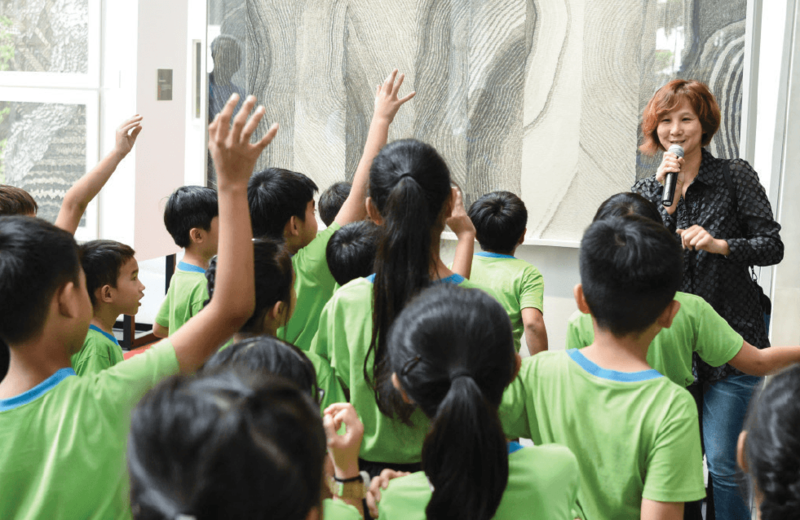 An uplifting experience for children from our beneficiaries who were on an excursion to the National Gallery Singapore with our UOB volunteers. Children with art in the palm of their hands at Art Central in Hong Kong. Through our wide range of art and education outreach programmes, we nurture young minds and encourage their exploration of creativity to help them develop to their full potential. Reaching out to children and students both inside and outside of the classroom. 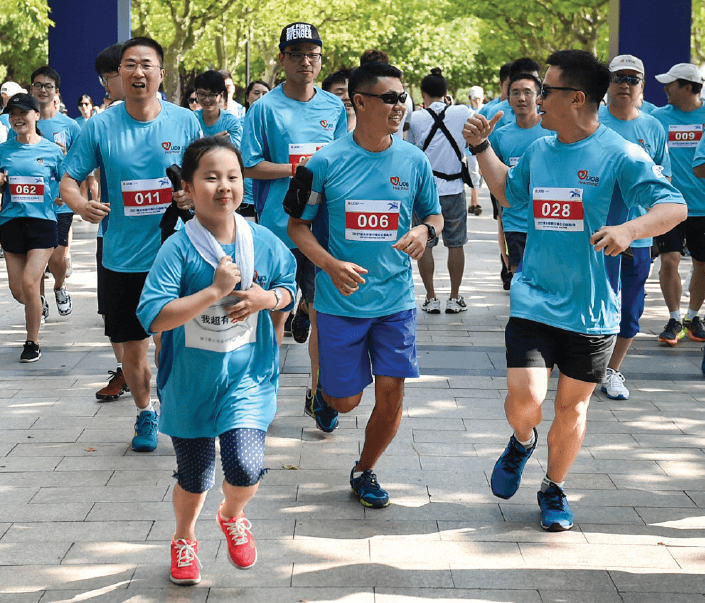 The UOB Heartbeat Run/Walk is our annual flagship event to raise funds to improve the lives of children in the region who are underprivileged or have special needs. On a selected day every year, our families, friends and customers come together for this purpose. 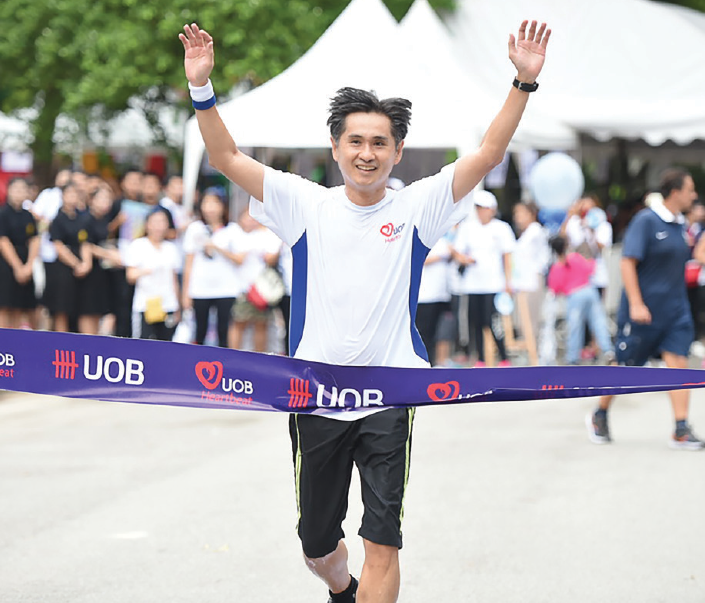 We have seen avid participation since the first UOB Heartbeat Run/Walk was held in Singapore in 2007. Building on the momentum, we expanded this activity across Asia with Malaysia in 2008, Indonesia and Thailand in 2011, China in 2012 and Hong Kong in 2014. 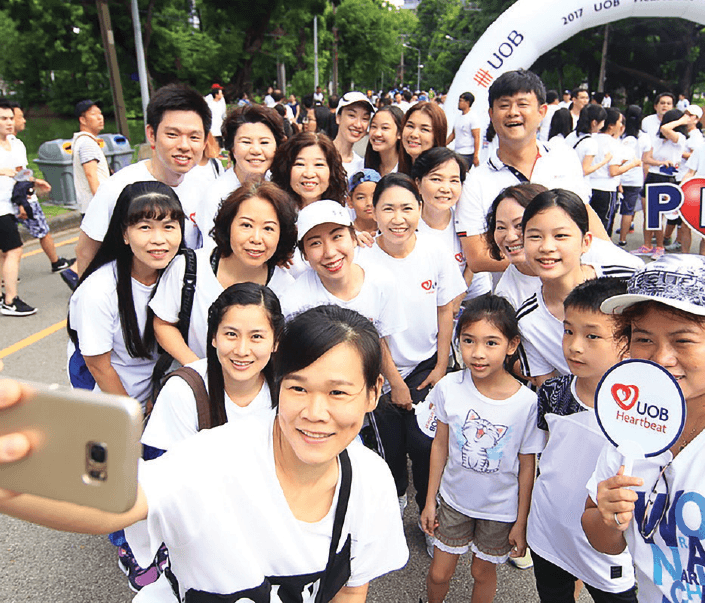 In 2017, more than 14,500 participants raised $1.42 million for their local beneficiaries through the UOB Heartbeat Run/Walk event held simultaneously across the region. Keeping the good going across the region at our 2017 Heartbeat Run/Walk. We believe that education gives good grounding and a head start in life to children, especially those from less privileged backgrounds. To help our beneficiaries develop to their full potential, we partner with other organisations to develop programmes and to conduct financial literacy workshops for them. In 2017, our team in China collaborated with the Yicai Foundation to launch the UOB Brings The World To Me programme for 800 children from primary schools in the remote mountainous areas of Yunnan province. This programme exposes the children to the world beyond their rural community by giving them access to online courses on a range of subjects such as science, culture and basic financial knowledge. To overcome geographic barriers, the students study through live and pre-recorded sessions conducted by volunteer teachers. These sessions are projected onto television screens donated to their schools through the Yicai Foundation. More than 600 volunteers in China, including our colleagues, signed up as volunteer teachers for this programme. Our colleagues also distributed daily necessities and school supplies to the students. 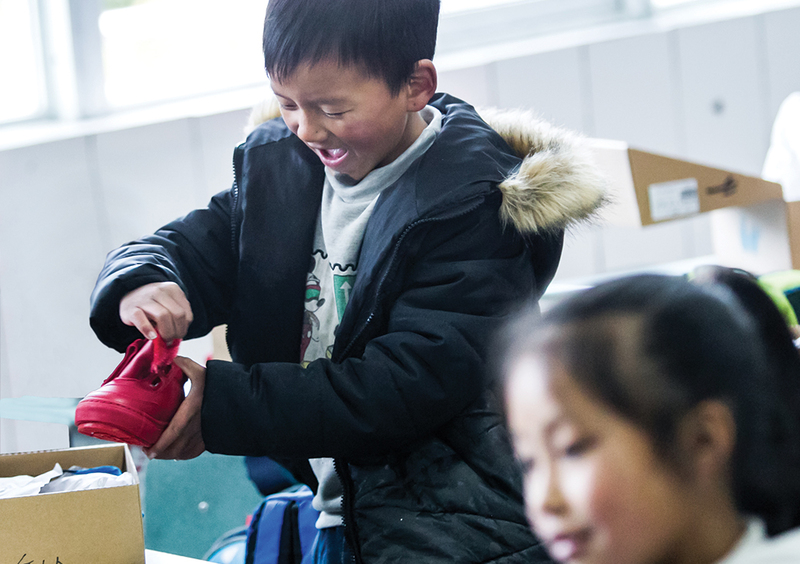 The children at Central Primary School in Pian Ma Yi Minority Village are spurred to put their best foot forward in the new academic year upon receiving gifts of new shoes from the UOB China team. As part of UOB Malaysia’s effort to educate the younger generation on financial management, the team held Money Wise Street Smart seminars at the Tunku Abdul Rahman University College and at the Monash University Malaysia in 2017. About 700 students attended the seminars. Our Bank was also among 70 financial service providers that participated in Bank Negara Malaysia’s Karnival Kewangan (Financial Carnival). Our people organised a four-hour educational programme to teach children how to spend and to save wisely through interactive board games and scavenger hunts. The team also took 30 children from UOB Heartbeat beneficiary, Dignity for Children Foundation, to participate in the event. In Indonesia, more than 70 of our colleagues visited the Madrasah Ibtidaiyah Rabbani in Bekasi and ran a fun financial literacy workshop for 70 students between 10 and 12 years old. Through the games, our volunteers taught the children the value of saving and the importance of adopting good investment habits at a young age. They also rolled up their sleeves to repaint the school’s facilities and prepared healthy meals for the students. As part of our commitment to the long-term development of Myanmar, we partnered the University of Yangon and Yangon University of Economics to introduce the UOB University Scholarship Programme. The three-year programme which started in 2015 aims to nurture a pool of banking and finance talents in Myanmar and the scholars could also apply for internship positions with us to gain first-hand experience in the banking and finance industry. Between 2015 and 2017, a total of 45 students received financial assistance from us to complete their university courses. 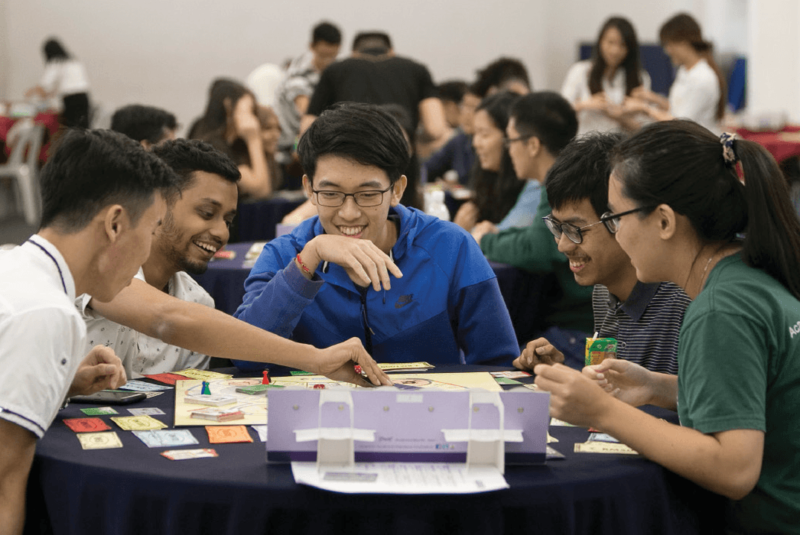 Children and university students in Malaysia are learning how to manage their own finances through fun and games. Every Lunar New Year, the UOB Commercial Banking teams across the region team up with our clients to help the community. 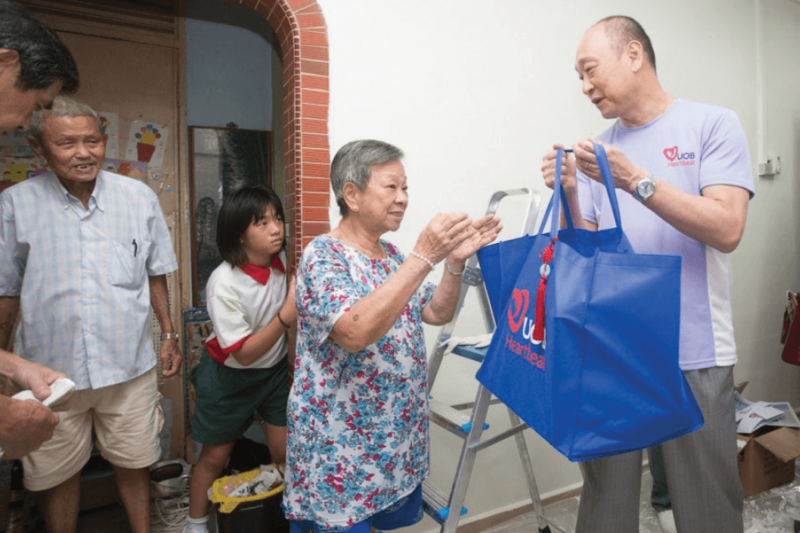 In 2017, our Deputy Chairman and CEO Mr Wee Ee Cheong led 100 UOB volunteers and clients in Singapore to spruce up the flats of 16 financially-stretched families under the UOB Heartbeat Lunar New Year Outreach initiative by Group Commercial Banking. In collaboration with Fei Yue Community Services, the volunteers painted the homes and set up new furniture donated by the Bank’s clients for the families to usher in the Lunar New Year. 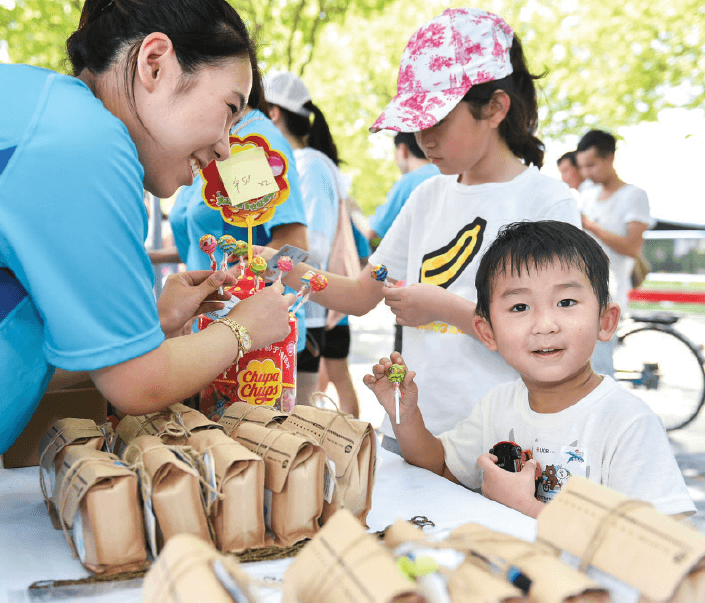 Our clients also sponsored goodie bags for 360 families living in the vicinity, as well as school supplies for 70 children from the Fei Yue Student Care Centre. 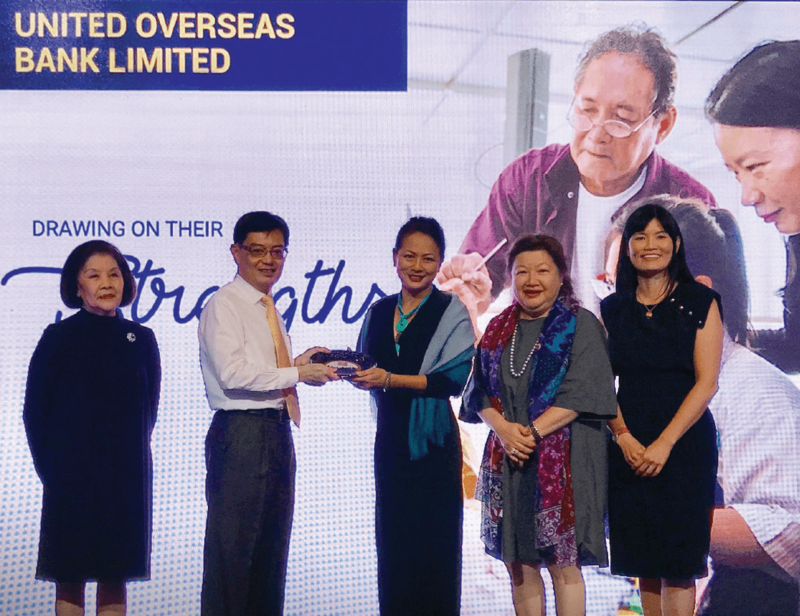 In Singapore, more than $1.2 million was raised for local charities by the more than 1,000 local and regional business leaders at the annual UOB Commercial Banking Lunar New Year dinner. UOB Singapore and Malaysia raised funds through the Commercial Banking teams’ Lunar New Year dinner for local charities. 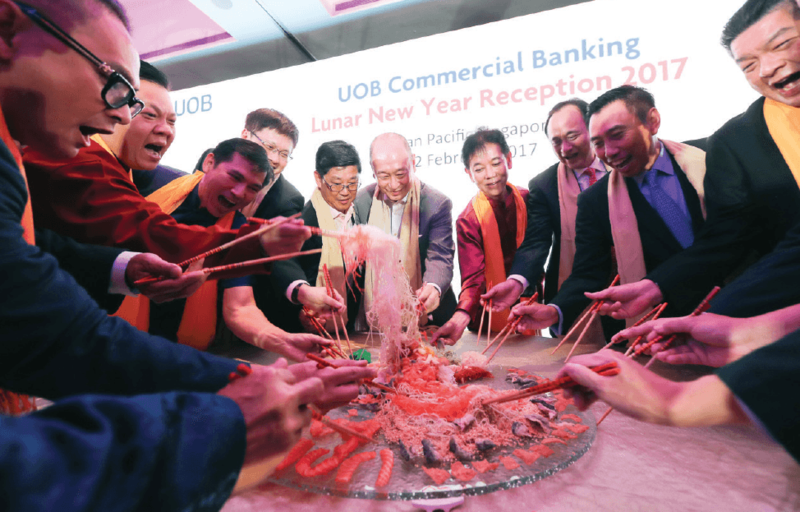 The UOB Malaysia Commercial Banking team also organised an appreciation dinner for some 1,000 customers during the Lunar New Year period. Chinese paintings depicting the Year of the Rooster by local speed painter Ms Haze Long were auctioned and the proceeds were donated to four charity homes around the Klang Valley. In China, our Commercial Banking colleagues from our Shanghai branch and China headquarters celebrated the Lunar New Year with the elderly at Shanghai Jiyanghong Nursing Home. They decorated the nursing home, played games with the residents and performed for them. Apart from the festive celebrations, the team also made a donation to a fund used by the nursing home to celebrate the birthdays of the elderly. Our Deputy Chairman and CEO Mr Wee Ee Cheong, UOB employees and clients across the region helping the beneficiaries prepare for and celebrate the Lunar New Year. 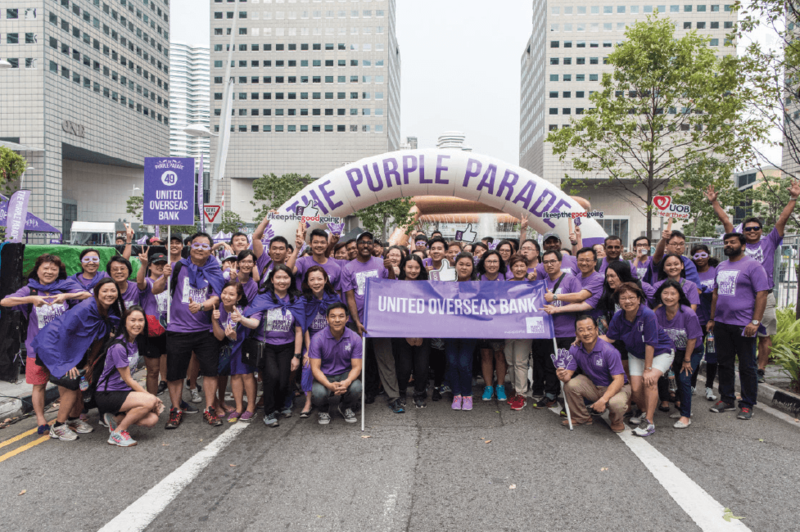 In championing a more inclusive society, 200 of our colleagues in Singapore participated in The Purple Parade 2017, a movement that supports inclusivity and celebrates the abilities of persons with special needs. 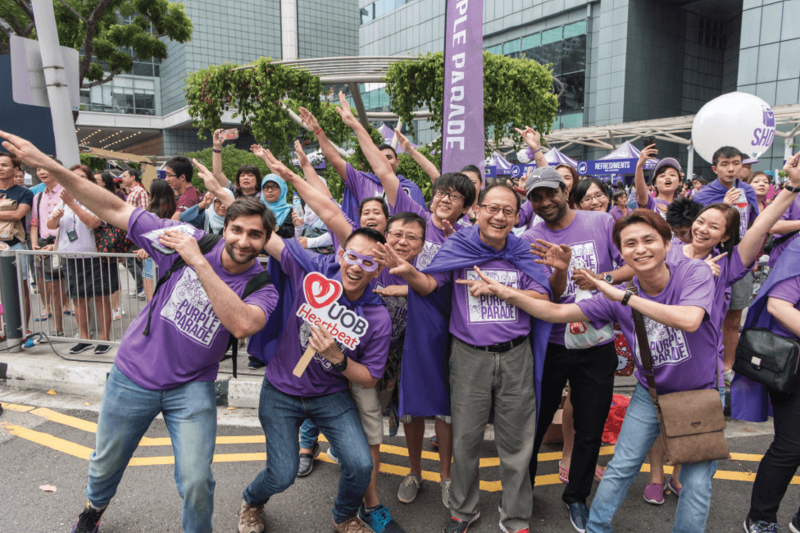 Supporting an inclusive society by participating in The Purple Parade 2017. More information on our efforts to develop an inclusive workplace can be found in the Colleagues section of this report. 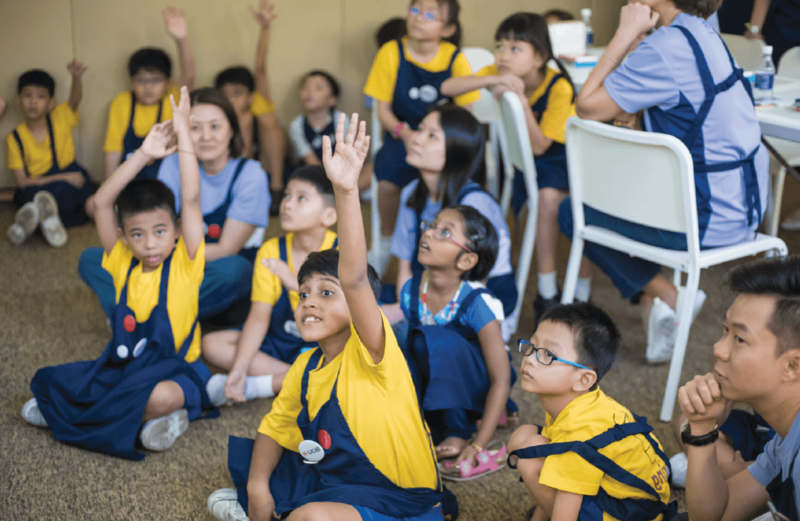 In Singapore, UOB was a proud supporter of the Central Singapore Community Development Council’s month-long campaign, the Giraffes Singapore movement. 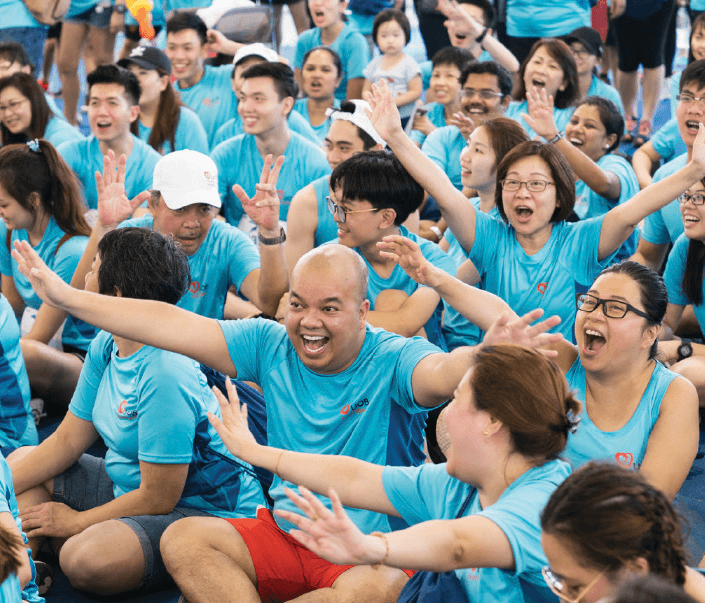 Our people volunteered at the celebration event held at the atrium of UOB Plaza, where they encouraged others to become Giraffes – to stick their necks out for others and for the public good. We kept the good going by taking part in the Giraffes Singapore movement led by Ms Denise Phua, Mayor of Central Singapore District. In 2017, we became the first and only bank in Singapore to enable customers to use a peer-to-peer funds transfer service called PayNow to donate to charity. The service is made available through our UOB Mighty app. 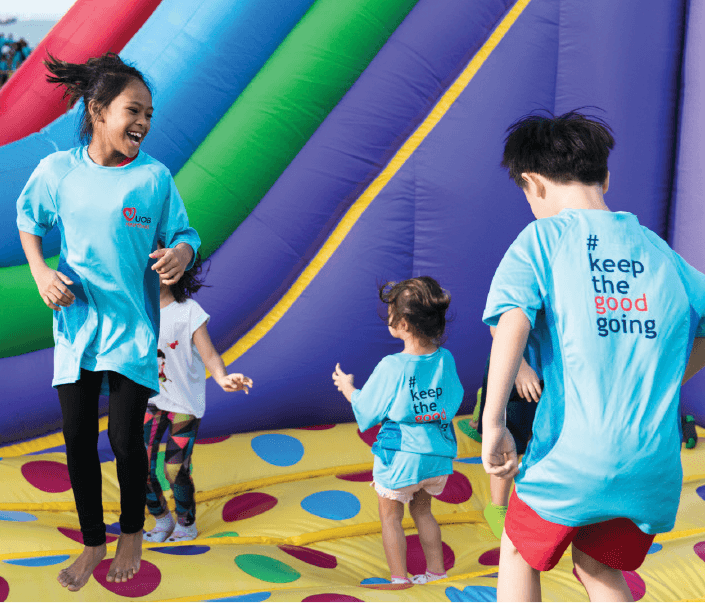 More than $120,000 was raised from our PayNow for a Cause campaign to support SPD’s early intervention programmes for infants and children with special needs. The SPD is a voluntary welfare organisation serving people with disabilities. 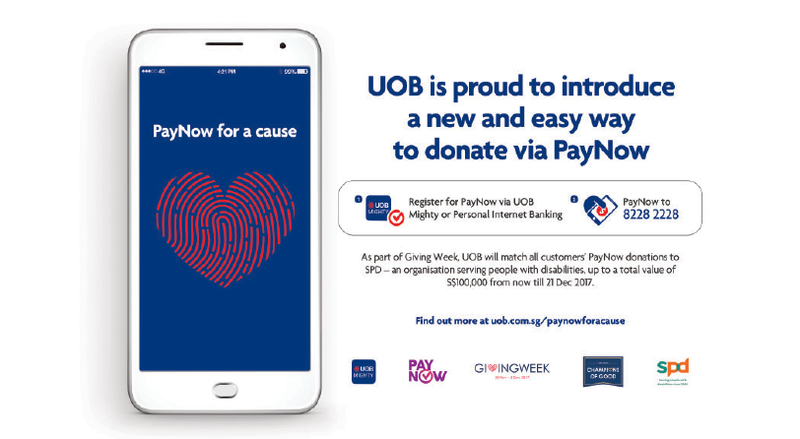 Our fundraising campaign PayNow for a Cause was launched during the Giving Week in Singapore. Our colleagues across the region volunteered more than 61,000 hours of their time at UOB Heartbeat programmes in 2017, an increase of 23 per cent over 2016. We also contributed $4.54 million to the communities in which we operate through sponsorships, donations, scholarships and funds raised by our colleagues, customers and partners. Special Events Platinum Award at the Community Chest Awards Ceremony 2017 organised by Community Chest in Singapore. 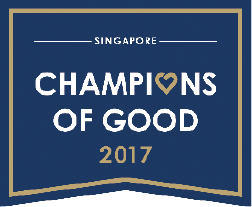 We received the Champion of Good award in Singapore from Mr Heng Swee Keat, Minister of Finance at the inaugural 2017 Champions of Good awards ceremony. 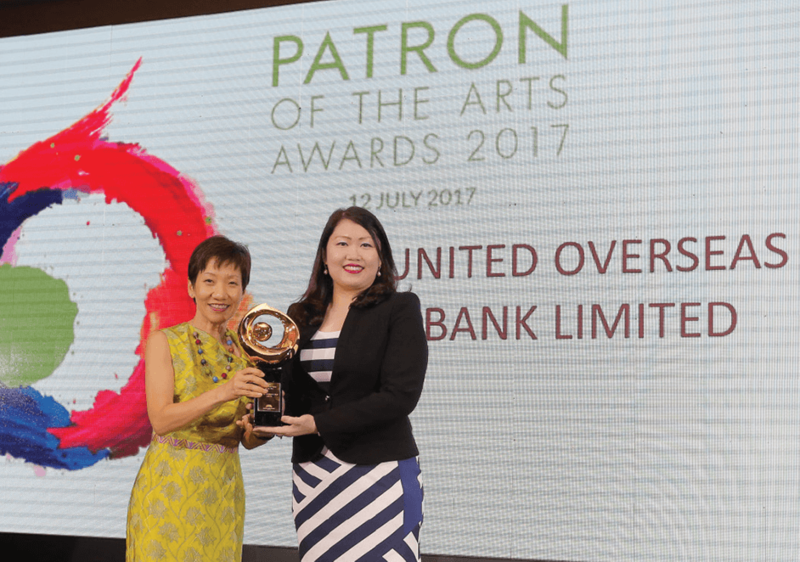 We received the 2017 Distinguished Patron of the Arts Award in Singapore from Ms Grace Fu, Minister for Culture, Community and Youth in recognition of our significant contributions to the local art scene.